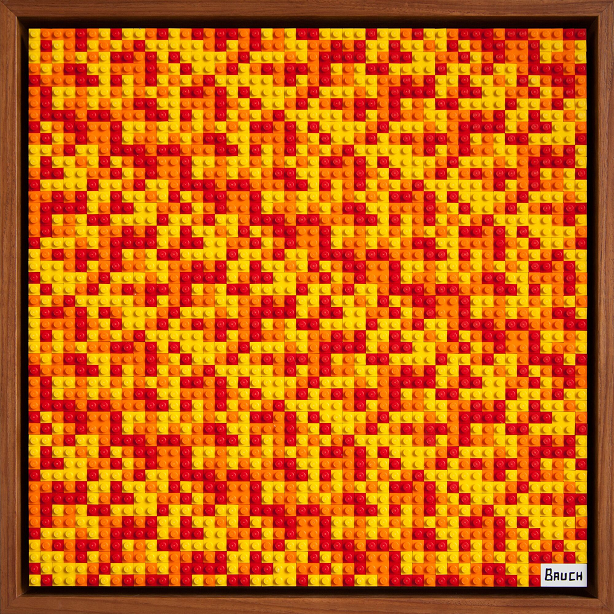 US artist Andy Bauch has created Lego mosaics that encode money in BitCoins and other crypto-currencies. Can a reader break his codes? 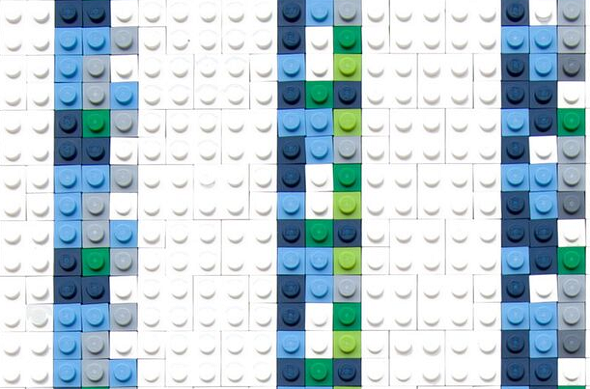 Until recently, I thought that I was the only one who combined cryptography with Lego bricks. But then I read a post by Des Wafler in the Facebook group of the American Cryptogram Association about an artist named Andy Bauch. 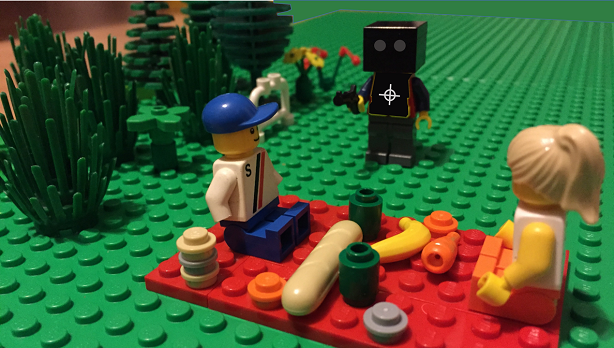 Apparently, Bauch has found a completely different way to bring crypto and Lego together. 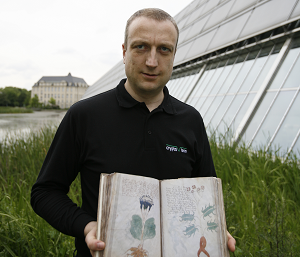 I have to admit that his creations are a lot more valuable than mine – they are currently worth over $10,000. It comes as no surprise that Andy Bauch’s current exhibition is titled “New Money”. … was born in 1983 in New York City. He lives and works in Los Angeles, CA. 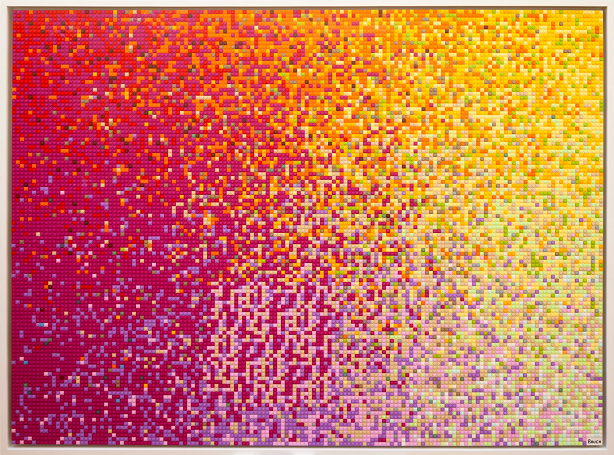 For his “New Money” project, Bauch selected Lego bricks because they are an “eye-catching and familiar childhood hallmark, as his medium of choice to echo the pixelated nature of digitization”. 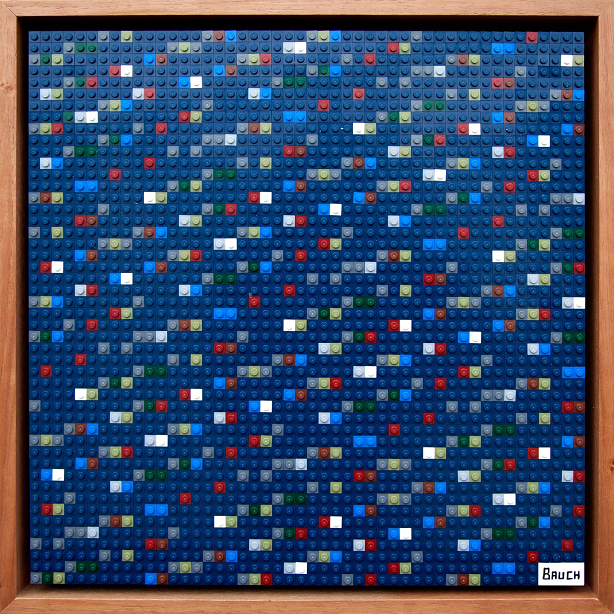 The artworks Bauch created are Lego mosaics that encode a certain amount of money each. To be more precise, each picture contains the private key to a crypto-currency wallet. 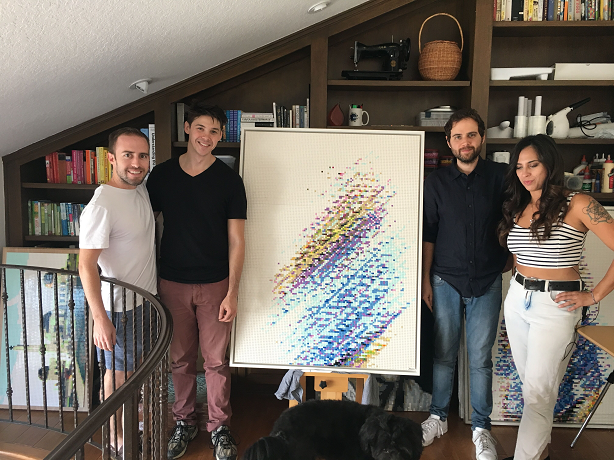 The title of each mosaic stands for the crypto-currency that is hidden in its pattern and how much it was worth at the time of creation, which ranges from $10 to $90. At the exhibition, the current value is displayed. Check here for a few more of Andy Bauch’s “New Money” pictures. Here’s an article about the exhibition. Of course, Andy Bauch doesn’t say how his Lego codes work. He just states that a clever attendee can steal the crypto-currency from the art by decoding the patterns. I don’t know how many attendees have been successful so far and how much of the encoded money has been spent. So, if you can decode the hidden message in one of the pictures, try to use the wallet and tell us how the code worked. Of course you can also use the comment section to share your ideas about the codes and the artworks. OTO is obvious…..but the others need their own additions to see the group that comprises the 5+1 Eyes Group that created this monster. The first line combines the AN over the O for the Alpha and Omega Themes or the Anarchist symbol that it forms…. The third line is also face value…….LAKAM is the Israeli Mossad’s Financial Division involved in many criminal enterprises like this one, used to skim off the top of the largest hedge funds ever created, and also to disappear numerous accounts at their own will, while they bankroll on it in their own accounts, until they then replace the coin’s traces from where they stole it from. Mt Gox was one of many thefts that were clearly orchestrated by this group, as even ciphers have revealed the name of one of the group that was later murdered on Mt. Hood….Jared Townsley from Swan Labs in Tigurd, Oregon. LAKAM is basically the worst of the worst and have embedded into almost every country’s infrastructure through their network of businesses. They are somewhat of an occult based, and pseudo religious order that is set up to appear as if they are a wing of the Jesuit order, and that it is supported by the Vatican, but I am not so sure that it is even recognized, being so new. They have connections through New England based banks and other collegiate associations, mostly centered in the Harvard/Yale student body and graduates that are networked into their ponzi structure of banking practices. So why would the addition of AN L BET to the specific locations all be triggered by the plain sight of the OTO? To me they are saying basically to Add Lilbet, the Queen, to cash in on these group’s efforts and to deposit their funds through the Bank of London. It is not surprising that the German Chancellor recently spoke AGAINST the use of these Cyber Currencies as a Monetary Standard, and that they would not be honored in Germany. I also know that these funds are a front for a paperless transaction system that can become a source for terrorists and criminals alike, as there is a reason that these funds are created to satisfy two interests : 1) To corral currencies into a single fund, to reap interest as a return, and 2) to be able to transfer funds and make payments for services without any documentation in physical form, whereas the law also mandates these records in order to be legally able to manage finances as a business entity. There are also many other ethical reasons behind Germany’s ban on the crypto currencies. Like the fact that Bit Coin is a non-entity, meaning there is no physical output of a product from the time spent in managing the services…..and there is no commodity to trade, therefore there is no value in their eyes. Can I have my 10,000 now? I almost forgot to tell you….. In one of the Messages in a Bottle from Hamburg is a part of a code for 156 BTC…I haven tried to crack that one but…..
Das ist ja mal kreativ!